Rotary Club of Morden - Welcome! I am very pleased to hear that John de Ronde has reported that building of the water tank and hand wash facilities in Tanzania are well underway. The first part of the financial support we agreed has been made. We were also pleased to report that John has managed to raise the majority of funds from a sister rotary club in Callington, Cornwall. It's good to see clubs working together. This is a project we are very proud to support and we look forwardto hearing more about progress and the next stage of the project when John returns. John will be back with us on 11th April. We celebrated Stan’s 90th birthday in great style. What a fantastic evening. Great friendship, lots of food courtesy of Cath at the Morden Brook and a wonderful birthday cake made by Jeanne Watson. Stan provided another cake the following Thursday. As President I have had the opportunity to accompany the Mayor of Merton, Councillor Mary Curtin to the Houses of Parliament. What a great experience. The occasion was a discussion regarding setting up a Rotary Peace Park on the border of India with Pakistan. Rotary has been involved previously in setting up a Peace Park on the border of Canada with America. District Council is to be held this coming Saturday at Reigate. I am unable to attend as I will be presenting, together with Tony Hunn, the Rotary cup at Little League. We move forward into April ready to attend District Assembly and gather our thoughts for the new Rotary year. John de Ronde, Tony Hunn, Jim and myself will be attending. Which makes me realise that I am now two thirds of the way through my term as President. Time is going by so quickly! Morden Funday is to be held on July 14th and of course, we will need all hands on deck. A precursor to Funday is Cheam and Sutton Rotary’s May Fair on 27th May. We have the opportunity to take a stall at this event. Please note the day in your diary. We have had two very interesting speakers this month. Tina Harvey, Head teacher at Perseid School and Erica Bishop who runs the Sailing Club at Wimbledon Park - a club we have always supported and who provided very welcome collectors to help us at Christmas. A huge ‘Thank You’ to John Telford who has arranged such a great programme of speakers. Sadly, William Rhind, our secretary has decided to leave us to join the Rotary Club of Putney. It will be more convenient to him. He has been a great help and support to us and we will be sorry to see him go. We wish him well with the proviso that he returns for the occasional visit! February has been a busy but exciting month. 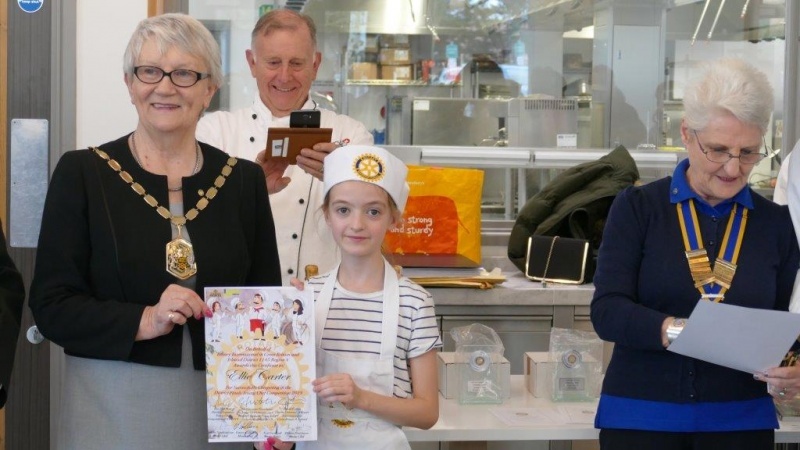 Morden Rotary hosted the District Semifinal of Young Chef closely followed by District Final. There were ten entrants for the final, all of whom had lots of supporters. Our Mayor and the District Governor were there to give support. Merton College were splendid in their help with hosting this event - we are so fortunate to have such a great venue for this competition. The event ran smoothly and efficiently thanks to all Morden Rotarians who make sure that this is so. Everyone knew their role and gave full support. It is good to have an occasion that runs well and is special –special for the parents and supporters and most importantly, special for the competitors who all put in such a huge effort and produce such amazing food. The Regional Final of Young Chef will be held at Orpington College - so we can now relax and let them take the reins. Morden Funday is to go ahead this year, 14th July – please note the date firmly in your diaries and watch out for our Morden Rotary stall. Any event that we attend gives us the chance to showcase Rotary and to do something to support the community. We are a small club but every member is involved in everything that we do. This makes for a successful and healthy club - working together to achieve our goals and playing a useful part in the community. Rotary South recently held a meeting, ‘Thinking Differently’, to look at ways to refresh and reinvigorate Rotary. So sorry I was not able to be there but some highly interesting and provoking ideas emerged from the meeting. I feel that it is the spirit of support and friendship that come not only from our regular meetings that is worthy of note but the automatic expertise and support we are immediately able to offer when we run any event. A valuable asset to our community. Barry will arrange a special membership meeting to give us the chance to discuss the results of the 'Thinking Differently' meeting and how we can respond to this. 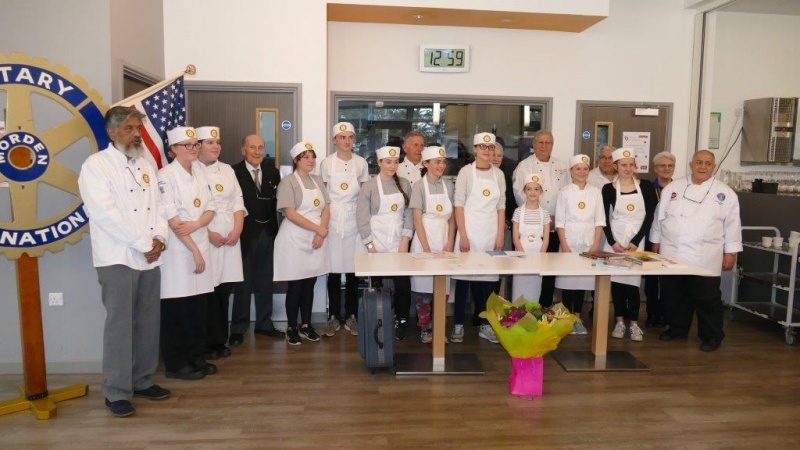 The Young Chef District Semi Final took place on 26th January at Merton Technical College. A big ‘Thank You’ to all of you who helped with this event. Special thanks to Brian, Tony and Joss who endured the cold wind to put up banners and organise the car parking. Thank you also to Stan for taking some great photographs. The competition winners were Florence Pattenden, sponsored by Rotary Club of Fleet, and Oliver Trowell sponsored by Rotary Club of Banstead. They now go on to District Final. This is our next challenge as we are hosting the District Final of Young Chef at Merton College on Saturday, 2nd March. Hopefully the weather will be a little better by then. Mark this date in your diaries now! John Telford has organised a varied speaker’s programme for us this year and hopefully we can take advantage of this to invite friends and colleagues to join us at club meetings. Our next speaker will be Gregory Alleyne from the Wimbledon Guild. We are all aware that Faith in Action are always in need of blankets and sweaters etc. in this cold weather. However, they are also grateful for rucksacks or backpacks to carry belongings during the day. It has been very nice to welcome our visiting Rotarian Hari Choudhary from the Rotary Club of Salford who has visited us regularly over the last few months whilst visiting his family. Finally, looking forward to our purple crocuses appearing soon. The weeks before Christmas are always busy for Rotarians fitting in collections with busy lifestyles. This year our number of collectors was increased by help from Wimbledon Park Sailing Club, Scouts and Little League which relieved some pressure on members. We also had four amazing Santas to help us. They all worked really hard and made lots of small children very happy. I find on the rounds that so many people ask ”What is Rotary? What do you do?” It is definitely time to address this and let people know who we are. Barry made a start organising the Rotary Open Evening which was quite a success and I am hoping we can repeat this Open Evening in 2019. A big “Thank You” to the Santas and every one of you who helped with the collections – the effort we put in every year to do this is not only beneficial because of the income but it also shows Rotary at work in the community. A special thanks must go to Brian for towing the float on all our routes, a gallant effort! Also many thanks to John De Ronde for stepping in and organising collectors and counting money when Philip was sadly called away. Rotary was certainly evident when Joss stepped in to organise a collection of food from Aldi on Christmas Eve and take this to’ Faith in Action’ to help feed the homeless. Well done Joss. As we move into the New Year, we host the Young Chef Semi Final on 26th January. Hopefully several of you will be able to come along and give your support. The Mayor will be in attendance. Thank you to John Telford for his work organising the speakers’ schedule. We have several very interesting speakers lined up to talk to us this year and this offers us the opportunity to invite guests to join us. Time now to move forward and enjoy the rest of our Rotary year. As we glide smoothly into the New Year I would like to take this opportunity of wishing everyone a wonderful 2019.